my labor partner | escaped. 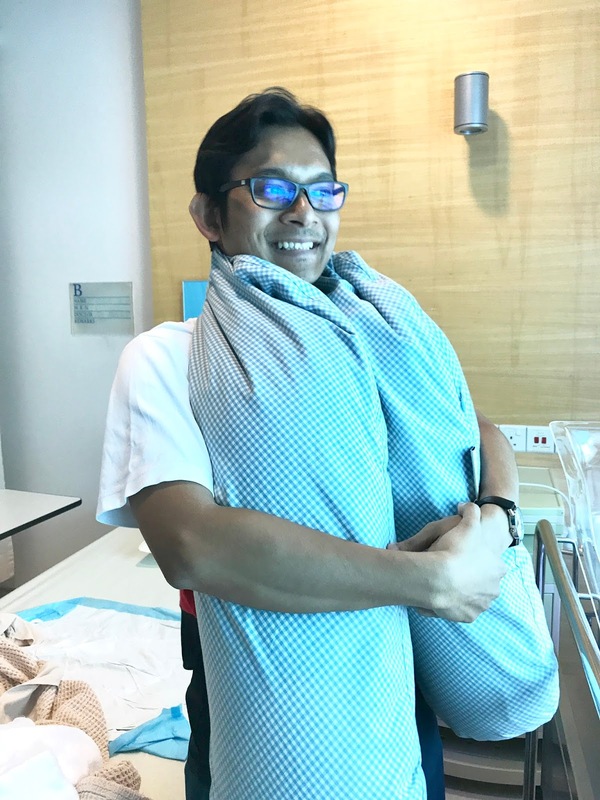 When I was counting hours and minutes to deliver Rayyan, I remember very little about what happened - the contractions were crazy and I didn't take epidural to help ease the pain. Still, I remember Shahrul was frantic next to me, his one hand holding mine and another holding air zamzam/kurma/gas; whichever the nurses told him to give me at the right moment. I remember he was very calm despite knowing what would happen, or maybe it's just his default face. But I remember that while nothing of this help ease the contractions, I was relieved that he's around. From the moment we had Rayyan, he's been more than a husband to me - he's been a partner all the way. Now what does a partner do? Basically everything you do, so you don't have to do the tasks alone. So that the tasks you have to do feel lighter because now the loads are divided into two. He is the one who showers Rayyan, changes his diapers, Rayyan's best cheerleader, his playtime partner, his bazar Ramadhan partner, and so much more; especially now that Rafiy is here and I have to focus my attention to the baby. He's with Rayyan more than I ever could (eventhough I'm the one delivering him) and not gonna lie, I feel so bad sometimes. If you asked me now how many more kids we'd want, I'd say two is more than enough for us. I can't imagine having another; which means we'd have to divide our attention more - it'd kill me because I already feel like I'm not there enough for Rayyan since I gotten pregnant with Rafiy and especially now that Rafiy is born. So I'm eternally glad to have a labor partner like my husband. So, Happy Father's Day, my labor partner. Can't believe we have two kids now!